Around Long Island, I don’t recall seeing Motorcycle Parking Only signs anywhere beside the lot in town of Port Jefferson. Is designated motorcycle parking common where you live? That’s a very cool picture. I’ve seen it in several cities (e.g., Cleveland, Boston) and always thought it was a cool idea. The narrower lines allow us to park more vehicles in less space, which is good for everyone. Oh, definitely! You can squeeeeee lot of bikes or scooters into a small space. We’re really off the mark here in our US cities. I didn’t even know Port Jeff had MC only parking, what lot is it in? Its along the fenceline in the Brookhaven/ferry lot. Guess they finally saw the light and don’t want bikes hogging up those precious spaces. Way to go Port Jefferson! Most cities and towns won’t even allow more than one bike in a car spot. Excepting dealerships and m/c events, I’ve seen a grand total of only two m/c-only parking areas: the Gap Diner (Gap, PA) has had one for at least 20 yrs., and the annual WWII Weekend in Reading, PA sets up a small area. I haven’t seen motorcycle parking in Minnesota! Seems like a good idea. Nice picture too!! 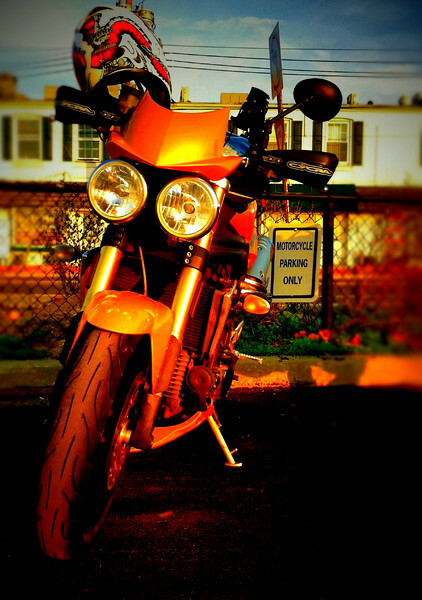 Corvallis isn’t exactly a metropolis, but we do have free designated motorcycle parking in certain spots downtown. Most of them are located in the nooks and crannies formed by sidewalks meeting the angled car parking on the street. There’s also a great big free motorcycle parking area directly across the street from campus. I’m seriously amazed that this one exists. The city can get away with it because it’s on the street. Step on campus and we have to purchase a $60 permit. Oh, I forgot! A few months ago I went to Brookhaven Town Hall (to serve papers) and was delighted to see they have about ten motorcycle-spaces in their parking lot. Half were filled. I can only think of two times I’ve parked in a motorcycle specific spot. Ron’s work has a designated spot right outside the security gate. The other spot was in a hospital parking garage, oddly tucked in a corner between car spaces. Tight, but it worked. Most of the time I just park in a regular space. I’ve noticed a few riders park in no-parking areas, or on sidewalks. I’ve never been brave enough to try it. Thanks, Kari 🙂 the iPhone is really a fun. I’m with you – i don’t park on sidewalks etc. I feel like it’s just inviting a ticket. Can’t do anything but agree with the others, very nice photo.